if you’re looking to alleviate pain without the use of medication, dry needling could be the answer you’re looking for! Dry needling techniques help stimulate your own pain relief system, without NSAID drugs. Dry needling is a branch of Acupuncture but differs slightly. Dry needling works by applying sustained pressure on tender points on muscles which reduces the patients pain. Pain relief works with the stimulation of the needle itself, and not on the substance administered. One of the first Physician to employ Dry Needling for pain relief was Dr Karel Lewit of Czechoslovakia in 1979. He reported favourable results on the use of Dry Needles i.e. stimulating trigger points with acupuncture needles in patients with musculoskeletal pain. 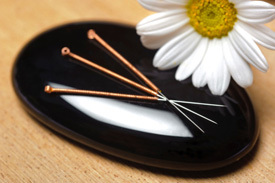 The use of acupuncture needles is a refinement of the earlier methods which used hypodermic needles. This significantly reduces the risk of haematoma and bruising associated with hollow needles. Tender points “Trigger points” are effectively treated today by health professionals using Dry Needling effectively and extensively throughout the world for the relief of pain and dysfunction.